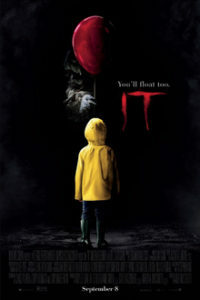 An okay movie, the scenes with the kids in their neighborhood trying to get to the bottom of a mystery are pretty cool, but the actual scares with the clown aren’t nearly as scary or exciting as they should have been. The movie It works on some levels, but definitely does not work on others. On the positive side, it captures that eighties nostalgia of kids riding around their neighborhoods in a group, trying to solve mysteries that no one else knew about. Movies like The Goonies, The Lost Boys, The Monster Squad, and E.T. really had that idea going for it. This was a mini-genre onto itself and the movie It fits in right alongside them. The kids in this movie are great. Their conversations are interesting. The only problem is that there are two many of them. Seven kids in the group. That’a a lot of characters to keep track of. The moments of these kids with each other or with their scary and threatening parents are really good. The deaths at the hands of the clown, Pennywise, however don’t quite work as well. For one, we really don’t see him kill or attack much. There’s the great opening scene, where Pennywise does actually attack,and then after that, it’s all kind of a mess. What we get are mostly daydreaming scenes where we don’t know what’s real and what’s a form of hallucination. We are in an age right now where if a horror movie has a somewhat decent plot, or decent characters, it will make a ton of money. It doesn’t have to be very good, but just has to do something a little different. Some examples of this are Lights Out and It Follows. It’s not a coincidence that these movies both have very simple titles, (as does It,) and that they are one concept movies. If the lights are off, the ghost will come, or a ghost is chasing after you and will continue to do so unless you pass it off to someone else. They work on a very basic level, but not much more than that. It,the movie based on the famous Stephen King novel about a murdering clown, is pretty much the same way. 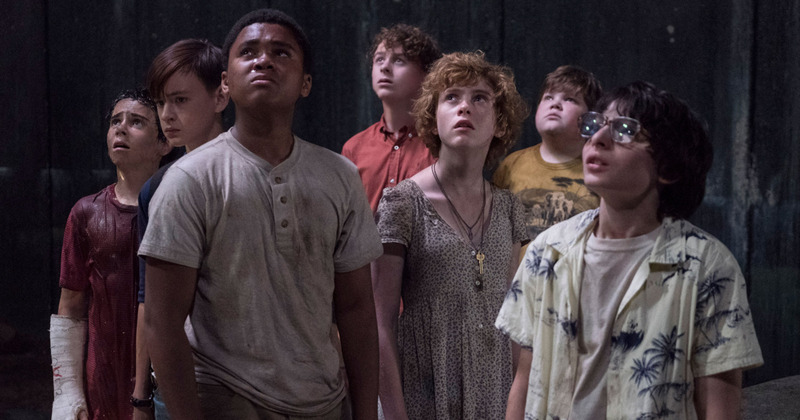 It’s a film that was made now, at a time when these sorts of horror movies are more popular than ever, and when TV shows like Stranger Things dominate in home entertainment. That show is about a bunch of neighborhood kids who take on monsters from another world, while riding bikes around their neighborhood. The movie It, is pretty much the same thing. In fact, it even features one of the kids from Stranger Things, Finn Woolfhard, (playing Ritchie.) These are movies about the kids who would generally be considered nerds, suddenly becoming the heroes. And it works for them because they believe in magic and madness on a level that the adults would just consider being ridiculous. The idea of kids in the neighborhood, handling these forces of evil, in the eighties, really stems from the movies of Steven Spielberg at that time. E.T. and the Goonies, to be specific. The Lost Boys, though not Speilberg, is another reference. In that movie, the kids believe the local bad boys who hang out on the beach are actually a gang of vampires. Stranger Things found a way to cash in this eighties, group of boys taking on evil nostalgia, where other movies tried and couldn’t, (such as JJ Abrahms’ film Super 8.) Now the movie It, has cashed in on what Stranger Things has done. Only the product isn’t exactly getting better. It might have the neighborhood element going for it, but it doesn’t quite work in terms of storytelling. The movie is about a sadistic murdering clown who lives in the sewers of the town of Derry. The group of kids who hang out together call themselves The Losers. They are the ones who figure out what’s going on when they start comparing the experiences they’ve been having and realize that it’s pretty much the same thing happening to all of them. That’a pretty much the gist of the story. The kids are interesting, and are all fine actors who help push this thing along, but the story itself is hardly anything special. The movie opens with an introduction scene where two boys, Bill and Georgie are talking in Bill’s bedroom. He’s the older brother and has an injured arm, in a cast. Bill and Georgie make a paper boat together and Georgie runs out into the street, during a storm to let the boat float down the street. Georgie drops the boat and then runs after it, following it from one street to another, as the boat goes sailing away. Eventually, he loses sight of the boat, next to the grating of a sewer. That’s when he sees two big yellow eyes staring out at him. The eyes belong to a clown named Pennywise. He moves closer, into the light, and we can see his face, all made up in white. This is one of the few times we will see the Pennywise, where computer effects are not being employed to make him move rapidly or transform or something. His opening, in the sewer, leads to a very scary moment, as the clown pops out the grating and bites off Georgie’s arm. Then, while Georgie is screaming out in pain, Pennywise grabs him by the feet and drags him into the sewer. And that’s how the movie begins. This might be the first scene in the film, but it’s also the best. For one thing, it’s by far the scariest. But for another, we see Pennywise actually attack, and do something horrific, and that really stays with us. He doesn’t do anything else like this in the rest of the movie. Instead, we go onto meet the bunch of kids in the group, and follow each one of them on little scares. There’s Bill, the unofficial leader of the group, who has a stutter. He’s Georgie’s brother from earlier. Then there’s Ritchie, (Woolfhard,) Eddie, (a smaller boy whose mom tells him he’s always sick,) and Stanley, (a Rabbi’s son.) Now that’s four right there. It’s all there really should be. Maybe four and then a girl. This movie actually adds three more characters to the group and only one of them is a girl. Those three additions are Ben (a heavy kid, who spends his time either being tortured by bullies or going to the library to research the town. There’s also Mike, the Tolkien black kid of the group. (he’s home schooled, and doesn’t really know the others,) and then finally there’s Beverly, who becomes on of the main stars of the movie. That’s seven main characters. It’s too many to give each of them a real story and that becomes a problem. The other problem is that the clown kills or scares aren’t really that scary. Instead of seeing what Pennywise actually does, the camera just cuts away, right when he runs at someone. This happens to a bully who Pennywise comes upon while in a sewer pipe tunnel. And when we do see Pennywise, throughout the film, the movie uses CG effects to make him move. It looks fake. Computer effects should never be used in a horror movie. The thing that makes horror scary is the realism of believing you are actually watching something terrible. CG effects just make it look like art. But what does work about the movie are the relationships between the kids and the small town dynamic. While there are too many kids to really get to know them (or at least, to get to know all of them,) some stand out more than others. Beverly, in particular, is very memorable. Maybe that’s because she’s the only girl in the group. But her character has demons to go through, just like the others. In her case, it’s her abusive father. In the case of Eddie, it’s his mom who is making him sick, just to keep him indoors. These are the real scares of the movie. And experiencing them alongside the children is interesting. These young actors really pull of what they’re going for, which is acting like real kids, cursing and telling dirty jokes and all that. There’s one great scene, for example, when they are all sunbathing in their underwear, and all the boys are staring at Beverly while she is asleep. Then she looks up for a moment and all of the boys look away, pretending they were looking at something else. These kinds of scenes are fun, but they’re not enough to make the movie. What’s missing are the big scares from the clown that we expect when we go into this movie. That first scene with Georgie was perfect. More of that would have gone a long way. But instead, the scares with Pennywise are more like his face turning up in places. A hanging picture on a wall falls down when one of the kids is alone in a room, and the woman in the picture’s face turns to Pennywise’s. And in another scene (which turns out to be the best scare in the movie, other than the opening,) the boys are using a slide projector and suddenly the machine becomes possessed, flashing images at a rapid pace until it ends on an image of Pennywise. These scenes are good, but they should not be the best or scariest scenes in the film. The fact that they are tells you that this film just isn’t scary enough.